IPCC : Intergovernmental Panel on Climate Change. I am currently a lead author of the chapter "Ocean, cryosphere, and sea level change" of the Sixth Assessment Report (AR6) which will be published in 2021. ESA CCI Snow : The Snow_cci project aims to contribute to the understanding of Snow in the climate system by generating consistent, high quality long-term data sets that meet the requirements of the Global Climate Observing System (GCOS). SCAR AntClim21 : The goals of AntClim21 are to deliver improved regional projections of key elements of the Antarctic atmosphere, ocean and cryosphere for the next 20 to 200 years and to understand the responses of the physical and biological systems to natural and anthropogenic forcing factors. 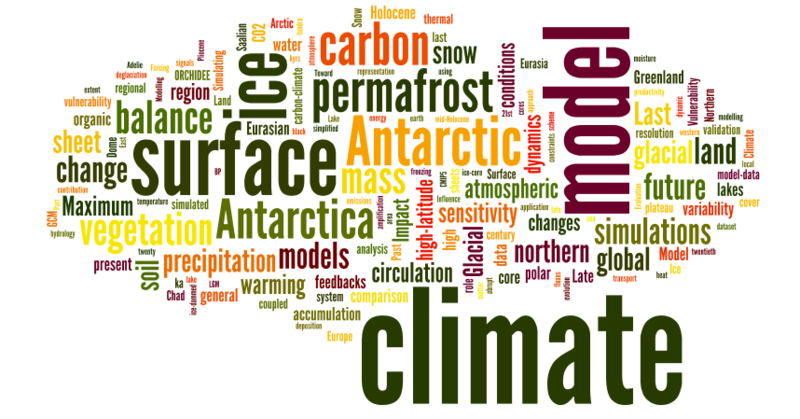 CliC : Climate and Cryosphere core project of the World Climate Research Programme. I was a co-chair of the CliC Scientific Steering Group from 2014 to 2017. -* CLIMERI : CLIMERI-France est l’infrastructure nationale de modélisation du climat. Elle a pour mission la réalisation des simulations numériques internationales programmées dans le cadre du Programme mondial de recherches sur le climat (WCRP) aux échelles globales et régionales et la mise à disposition de leurs résultats pour divers utilisateurs. Elle inclut également les simulations régionales nationales de référence sur la France.